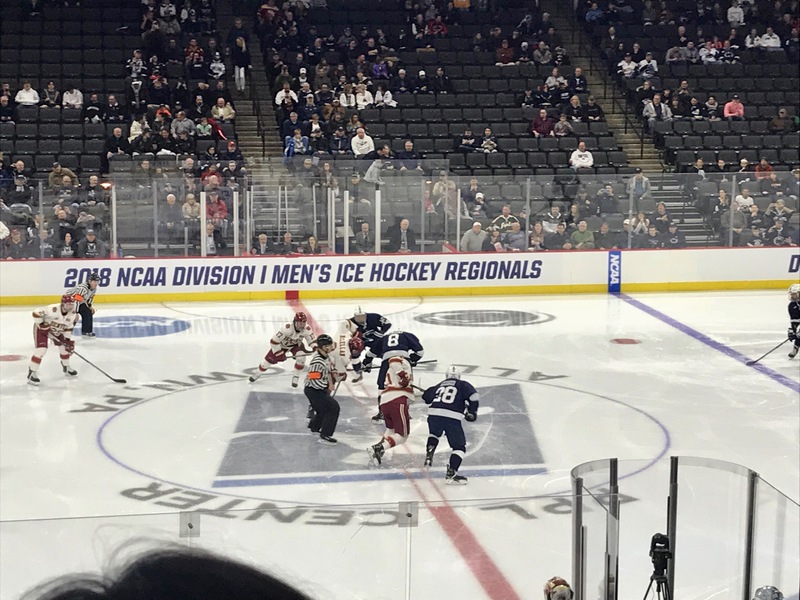 The curiously named, “Midwest Regional” for NCAA D-1 hockey was held in Allentown over the weekend. Both the Curator and I thought that the city put on a decent regional. The interest was here, and the community seemed to know why we were here, which is always a good sign. The Princeton Tigers would face the Ohio State Buckeyes in game one. 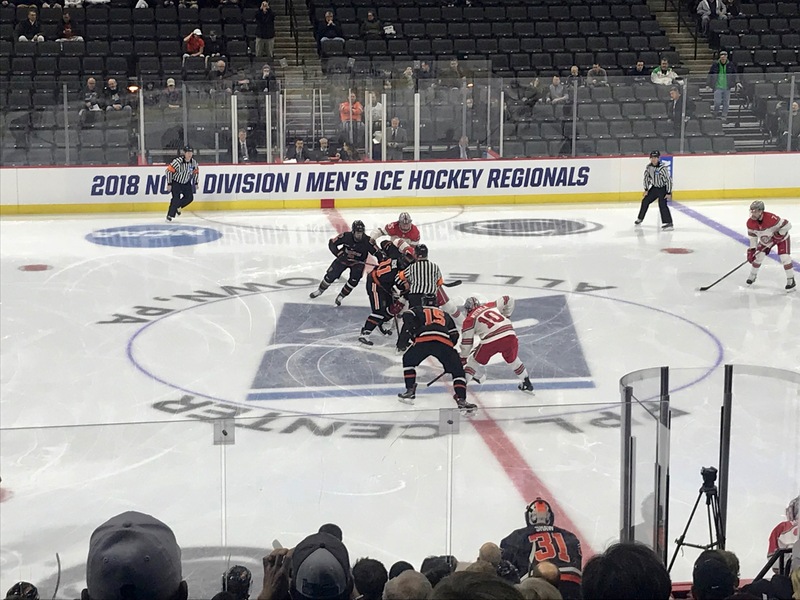 It looked like the Princeton magic from the ECAC tournament was running dry, and not even the Hobey Baker video could drum up some extra life for the Tigers. OSU scored twice within 20 seconds in the first period. There was no score from either team in the second period, then OSU scored two more goals in the third. Princeton finally showed some life, when OSU took a penalty with less than a minute left in the game. Princeton would score twice in the final minute, but that was not enough to avoid a season ending loss. OSU gets the W, 4-2. We went into game two thinking we’d see some great hockey. Unfortunately, only one team provided that. The game was never as close as the opening puck drop; Denver just beat Penn State in every facet of the game. The crowd was decidedly pro-PSU, but that only made for a lot of very disappointed fans. Final score: 5-1 Denver. We finally had a game. Ohio State and Denver were evenly matched, and the up-tempo style of play was fun to watch. 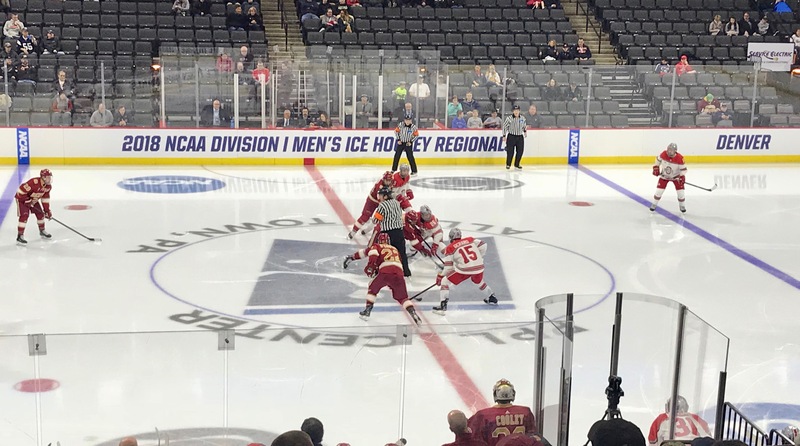 A lot was on the line: Denver was the defending national champion, and Ohio State had never made a Frozen Four field before. The first period was scoreless, and both goalies had been looking good. OSU finally got a puck past DU net minder Tanner Jaillet on a nice backhander by Dakota Joshua. Then, 3/4 of the way through the second period, OSU doubled their lead on another beautiful backhand shot by Kevin Miller. Things were looking up for the Buckeyes. OSU would take a 3-0 lead before Denver scored their first goal. OSU gets their first trip to the Frozen Four with a hard fought 5-1 win over Denver. Sean Romeo, the OSU net minder finished with 30 saves, and was the Regional MVP. The field is now set for Saint Paul. Three B1G Teams will advance: Michigan, Ohio State and Notre Dame. Minnesota-Duluth also advances for their second trip in two years. 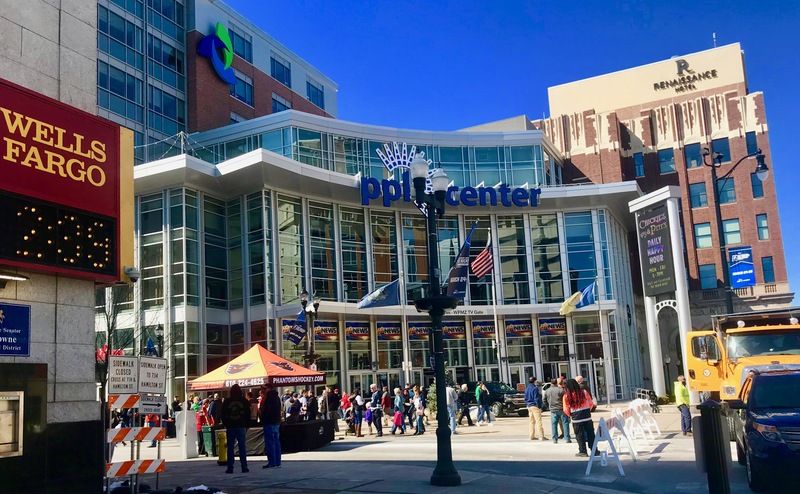 This entry was posted on Monday, March 26th, 2018 at 3:31 AM	and tagged with history, hockey, ice, pennsylvania, photo, travel and posted in sports. You can follow any responses to this entry through the RSS 2.0 feed. Sounds like some exciting playoff action! !